You’re self motivated. You don’t need someone telling you what to do and can get things done without someone looking over your shoulder. You can stay cool under pressure. Running your own business can be demanding and stressful at times. By staying calm and focused on the task at hand, you can withstand the storms that are sure to come. You have passion for what you do. You don’t just like it, you love it. It’s not work to you, and you could do it 24 hours a day, 7 days a week and not get tired of it. You don’t like to give up. When you start something, you finish it. You enjoy the challenge of someone saying it cant be done, or that YOU can’t do it. You’ve been fired multiple times. This could mean you’re not meant to work for someone else. You worry about layoffs. It can be stressful wondering if you’ll have a job tomorrow and how you’ll survive. The robots are coming. Automation is here to stay. You think outside the box. Instead of following the crowd, you seek your own path and have your own ideas. You’re also not afraid to implement them. You’re not afraid to take risks. The most successful entrepreneurs are willing to step out of their comfort zones. They know the bigger the risk, the greater the reward. You prefer to associate with go-getters and other entrepreneurs. Birds of a feather flock together. You’re bored with routine. Some people prefer the 9-5, while others prefer a more flexible schedule. You read about successful entrepreneurs. You wonder how Oprah, Steve Jobs and others became successful. What did they do?? You want multiple streams of income. Many people want this, but the entrepreneur actually works hard to make this a reality. You want to leave a legacy. Many entrepreneurs want to create a business that can be passed down from generation to generation. You like being responsible. You enjoy being in charge and being the prime decision maker. You want to be your own boss. No further explanation necessary. Should you be self-employed? Sound off! What are your top signs that you should be self-employed? Get more great tips in my new book Readi-Set Go! A Simple Guide to Establishing a Successful Small Business in paperback or Kindle on Amazon. Pick up your copy HERE! Trouble Looming: Robots Taking 38% of ALL US Jobs in 15 Years? The article goes on to say this increase is greater than other industrial nations like Britain, Germany and Japan, with finance, hospitality, food service, transportation and storage being affected most. Fifteen years may seem like a long time away, but in reality that is sooner than we realize, especially when you think about the tremendous impact this will have on our society. If these changes do occur, where will people work as an alternative? Are people being prepared for the change in the workplace climate? We’re already seeing the affects of automation in retail. Stores like Macy’s Sports Authority, Sears and J.C. Penny are closing outlets across the country. Read more about that HERE. No one truly knows what will happen. Some say the automation will bring more job opportunities, such as a demand for workers to who maintain the new technology. Others say legislation will prevent the use of robots in many industries so the impact won’t be as severe. Whatever the case may be, we must acknowledge that the work environment could be changing drastically in the near future. There’s no guarantee that your job or industry won’t be affected. It’s important to be aware of all trends and how to ensure you can survive in this new climate. It’s also wise to think not only about yourself, but your children: How will this affect them in 15 years? The time to start preparing for the future is now, and one way to do this is by starting your own business. Instead of sitting back and waiting on something to happen or hoping someone invests in your education, identify ways to increase your value. One way is to determine potential employment opportunities in the new world of automation. Another option is to consider starting your own business. I’m a big proponent on starting your own business. The key is to find something you enjoy and determine how to effectively make money doing so. Not everyone will have the skills needed (or desire) to work with the new technology that’s coming. Others will quickly their skills will become outdated and they may be on the outside looking in. Whatever a person decides to do, it will take time, and NOW is the time to start preparing. It’s for reasons like this that I wrote my book (along with Jeffrey White) Readi Set Go – A Simple Guide to Establishing a Successful Small Business. Once upon a time, a person was guaranteed a job working in a factory they could retire from and collect a nice pension. Today, a person risks getting laid off or changing jobs every 5 years. Starting the right business can help alleviate these uncertainties. Pick up a copy of my book HERE on paperback or Kindle. The world is changing quickly. 38% of jobs lost will affect millions of workers and their families. Don’t be left behind. Will you be readi? 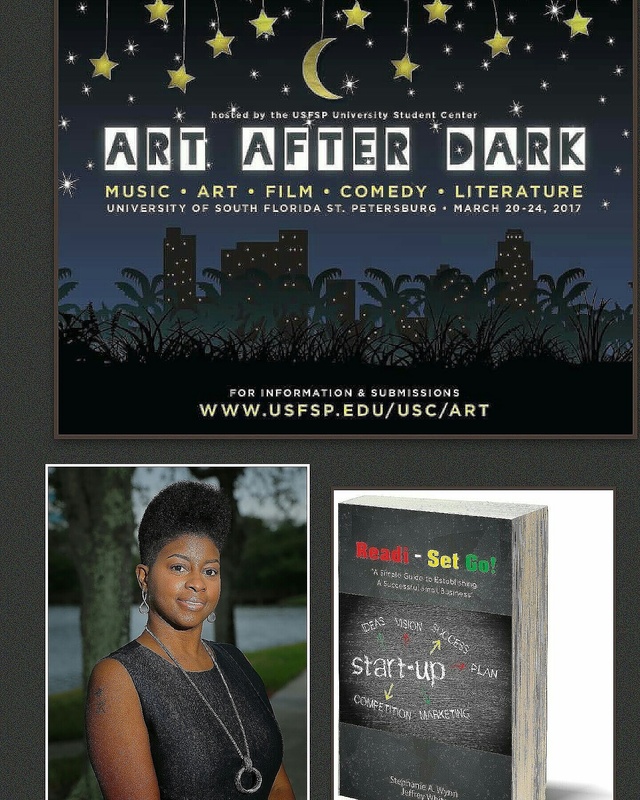 Come out and join me and local artists and authors at USFSP University Student Center ART AFTER DARK..tonight Friday March 24, 2017 7pm!!!.. If you cannot make it and would like to purchase my book… Readi-Set-Go!!! Click on the link below. Do yearn to be your own boss? If so, you’re not alone. I encounter at least one person daily who wants to start their own business. Unfortunately, they have no idea what they want to do. I’m not good at anything. I don’t have any self-discipline. I don’t know what I like. I’m not smart enough to own a business. I don’t have any money to get it started anyway. I hear this all the time, and each one of these are incorrect. We ALL have a talent. We all are good at something, and not every business needs a lot of money to get started. Have an idea. This is a crucial first step, but it’s also where people become discouraged. They either draw a blank or think their idea is too far-fetched to become real. Facebook was started in a college dorm. Amazon and Apple Computers both started in a garage. No ideas are off limits. All you have to do is come up with something. What do you like to do? This does not mean what your parents want you to do, or what your bank account allows you to do. What do you like? Do you have any hobbies? Remove everyone and everything else from the equation. This is all about you. What are you good at? We ALL have a talent. Some people can write. Others can draw. Some have a knack for giving advice or being a good listener. Whatever it is, write it down. Locate the missing pieces. As you look at your list, what do you wish you had to make it easier or more fun? Is there something that would make your experience better? Is there a small niche that you could possibly fill? How can you help others who share the same passions as you to make their experiences better? Research. Thanks to the internet, there are many ways to find out about things you enjoy and have a passion for. Are there people currently generating income doing what you do for fun on the weekends or after work? If so, how? Go behind the scenes. If there are people already doing what you’re doing and getting paid, it’s time to do some digging: how did they get started? Are their groups or places where these people share ideas? if so, find them and get involved. Start small. Rome wasn’t built in a day, and neither will your business be. No one is suggesting you quit your day job tomorrow. However, many successful businesses were started on a small part-time basis that grew into full time ventures. Have patience and enjoy the journey. Learn everything you can. The most successful people are also the most astute. If you think you know everything already, you’ll never succeed. Become a student and read everything you can about that industry. Talk to those who are successful in your field and pick their brains. Stand out from the crowd and become the expert. People are willing to pay a premium to someone who knows what they are doing. Be that expert! We now live in a time where businesses of all types can be started and become successful. By using a little creative thinking, you too can turn your passion into your profession. Others have done it, why can’t you? Need more info? Pick up a copy of my new book Readi – Set Go: A Simple Guide to Establish a Successful Small Business. Available in paperback and Kindle on Amazon. Click HERE and get your copy today! As our society faces more job uncertainty thanks to layoffs and automation, starting your own business might be important than ever. If you want to start a business, no one will do it for you. Tap into your talents and go for it. You might be pleasantly surprised at the results. 1. Successful thoughts leads to successful outcomes. In order to achieve success, you must believe that you will succeed. No matter what’s going on, you know when the dust settles, you’ll be victorious. 2. Have a plan. Success doesn’t happen by accident. If you want it, plan for it. 3. Be ready to take risks. The most successful are also the most fearless. They aren’t afraid to step out of their comfort zones and give it all they got. 4. They don’t consider “failure” as failing. Unsuccessful people think if things don’t go their way the first time, it’s a failure. One setback will make them want to quit. Successful people know things take time and their plans may need tweaking along the way. 5. They don’t rely on others for their success. Successful people don’t wait on their “big break” or sit back and hope to be discovered. They will keep striving for greatness until they can’t be ignored anymore and people have no choice but to acknowledge them. Do you have what it takes to be successful? What do you consider the keys to success? Get more great tips in my new book Readi Set Go! A Simple Guide to Establishing a Successful Small Business. Available on Amazon in paperback and Kindle editions HERE. As most of you know, I’m a big proponent of people starting their own businesses. I think having your own business is not only good for you, but good for the community you live in as well as your family. I also think it’s becoming a necessity. Burger Flipping-Robot Replaces Humans on First Day at Work. Miso Robotics created the machine and it has created quite a buzz on the internet. Some people are saying it will cut costs and increase profits for companies. Others say paying someone $15/hour to flip burgers is too much, and they need to find better jobs anyway. Others are worried about the jobs lost and how it will affect workers. No matter a person’s opinion on this, one thing that we all should wonder is how will this affect jobs? If this machine catches on, how will this affect the workers? In order to fully understand what’s going on, we have to look at the big picture. Automation is affecting many industries across the board. Thanks to ATM’s, many bank workers have been displaced. CVS, J.C. Penny, Macy’s Sports Authority and others have closed stores, causing layoffs across the country and putting shopping malls in jeopardy. Automated systems can answer many of our questions when we call customer service for many companies. Job security is virtually nonexistent today. Many of us have either been laid off or had someone close to us lose their job through no fault of their own. I’ve written several blog posts about automation and how it will affect society. This machine just points out the urgency that we as a society should be feeling about future employment opportunities. Not just for us, but for our children. The number one goal of companies is to make money, and if a machine will help increase their profit margins, they will use that machine. That leaves us out in the cold. Automation is not going away. If anything, it will only increase. Instead of waiting to see if you’ll be affected, it’s time to be proactive and seek other methods of securing income. Starting your own business may be the best bet. I foresee a future much different for my children than what my parents saw for me. We can’t rely on a company to provide us with a great job that pays well. We have to create that for ourselves. Running a business isn’t easy, but it’s not impossible. In my book Readi Set Go! A Simple Guide to Establishing a Successful Small Business, I give valuable tips and insight on what is needed to run a business. Pick up a paperback or Kindle copy on Amazon HERE. These days, we all should be thankful if we have a job. Unfortunately, tomorrow isn’t promised to any of us, and neither is a job. Now is the time to educate yourself on how to run a business and create a job of your own that no one can take from you. This past weekend, I had the pleasure of speaking at the St Pete Business Networking Mixer. I really enjoyed it! I was the speaker for the evening and gave tips on starting your own business. There was a nice mix of people in attendance, young kids and their parents, a few senior citizens and everyone in between. A few were seasoned business owners and a couple were anxious to start their first business. There were a lot of questions and everyone was supportive and full of energy. We definitely need more conversations about starting a business. There’s so much people don’t know. A lot can be accomplished if people would work together. I LOVE what I do! I enjoyed talking to everyone about starting a business and the steps they should take to increase their probability of success. I’m convinced that starting a business is something more people should seriously consider. It’s not easy, but starting your own business is one of the best ways to achieve financial freedom in these unpredictable times. It’s also a great way to build up communities by providing jobs to those that live in the community as well as giving young people a first-hand look at running a successful business. The best way to teach someone something is to provide them with hands-on experience. What better way than to have parents that run their own successful business? I made quite a few contacts and sold a few books as well. I had a great time and can’t wait until my next speaking engagement! Click HERE to pick up a copy of my book Readi – Set Go! A Successful Guide to Establishing a Successful Small Business today on Amazon! Last week, Jeff and I had a GREAT interview on the Matters of the Heart Radio Ministry radio show with Princess Denise! We gave valuable tips on starting a business and talked about our new book Readi Set Go. This was a 2 part episode. Listen to Part I HERE! Company Downsizing: How Secure is YOUR Job? Have you ever been laid off? Share your thoughts! Are you readi to start your own business? Pick up a copy HERE! 1. Unconscious incompetence. These people don’t know that they do not know. They are blissfully unaware and are ok with that. 2. Conscious incompetence. These individuals know they do not know and are willing to seek the answers to the questions they have or learn how to solve their problems. 3. Conscious competence. This person knows how to do something, but they are working hard to master the skill. They aren’t quite there yet. 4. Unconscious competence. This is a skill that has been mastered and can be performed with little thought or effort. When it comes to running a business, being competent is mandatory. You must know what you’re doing to make it a successful. Unfortunately, this can be a blessing and a curse. The two most dangerous types of people in business are the unconscious incompetent and the conscious competent. Can they be one and the same? The unconscious incompetent doesn’t realize what he does not know can hurt him and his business in the long run. However, it’s very possible he’s become a conscious competent in the things he does know. A perfect example of this is a person who knows how to bake cakes. Everyone raves about how good their cakes are, so they decide to open a bakery. In this example they are a conscious competent. Baking cakes is easy for them. In this case, they are an unconscious incompetent. They don’t worry about these things or consider them not important. They don’t try to learn these aspects of the business because they feel good cakes will make everything better. This type of thinking (and lack of knowledge) will hurt their business, increasing the probability that it will fail. Another example is a doctor or lawyer who graduated from their respective schools ten years ago. In both cases, they were good at what they did, but the doctor failed to keep up with the new medical procedures, and the attorney didn’t know about the various changes in laws. As a result, they both became unconscious incompetents and quickly lost clients and became subject to lawsuits. No matter who you are or what type of business you have, it’s important to remember one important thing: there’s a lot you still don’t know. Never stop learning and seeking knowledge. The day you think you know everything is the day you start to lose. Your growth has been stopped and your competitors will capitalize on your mistakes. In business and life, you must be a conscious incompetent. By constantly looking for new ways to improve your business, you will find ways to get better, thus increasing your odds of becoming a success! In this day and age, having a business is more important then ever: Automation has made many jobs obsolete, and layoffs can strike at any time. (Our bills don’t care if you have a job or not.) It is time to seriously consider starting your own business and creating your own income. Learn how to create your own business in my new book Readi – Set Go: A Simple Guide to Establishing a Successful Small Business. Available on Amazon in paperback and Kindle. Pick up a copy HERE for you or an inspiring entrepreneur today!